Of course, everyone looks good in a batting cage, but I saw Erisbel Arruebarrena Sunday morning with Dodgers’ hitting coach Mark McGwire instructing him. It was a small sample size (two rounds of McGwire tossing him pitches underhand), but I liked what I saw. At first glance, Arruebarrena, soon-to-be-24, doesn’t look like a big guy, even if he is listed at 6’1, 200 pounds. But he must have hit the weight room really hard because he has some guns. They aren’t Yasiel Puigian arms, but there are some guns there for sure. McGwire was instructing him to not let go of the bat during his follow-through, as it decreases his bat speed. But Arruebarrena displayed surprising bat speed and a cleaned-up swing. He has a high leg kick for his timing mechanism, he loads on his back leg and drives through the pitch with his bat. He won’t be mistaken for Hanley Ramirez anytime soon, but perhaps there’s hope for the latest Dodger multimillionaire. Here’s a short video of him in the cage. Admittedly, this video doesn’t look all that great. The second round of hitting in the cage I saw was better than the first (after McGwire talked to him). Arruebarrena doesn’t have to be even an average hitter to be an impact player because of his plus-glove, but this session looked a lot better than I thought it would. Remember, he’s been off from baseball for awhile and had an ugly swing while in Cuba. It looks like McGwire has already helped him in that department, which bodes well for his future. 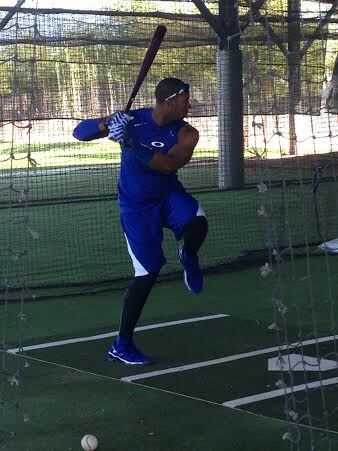 Despite the high leg kick, Arruebarrena still has an upper-body dominant swing. He could presumably generate more bat speed if he incorporates his bottom-half, but he’s yet to do so. He puts his front leg down quickly, which leads to the arm swing. There’s a long way to go, but there’s at least a glimmer of hope. Jose Vizcaino compared Arruebarrena to longtime infielder Tony Fernandez. If Arruebarrena could be even half of what Fernandez was (43.5 career WAR), the Dodgers will have hit on yet another international signee. He might not play in minor-league games while the Dodgers are in Australia, as they’re more worried about getting him into game shape. But he’s in good physical shape as it is, so maybe he will see the back fields this week. If not, it’s likely off to Double-A for him.